Check out our Med Spa! 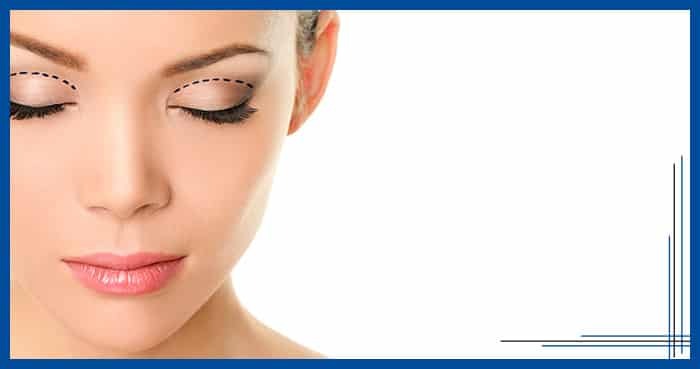 Blepharoplasty, or surgery of the eyelids, involves refinement, rejuvenation, and restoration by excision of the excessive eyelid skin for either functional or cosmetic reasons. The goal is to achieve “relaxed” eyelids and slow the aging process using advanced surgical techniques to impart rejuvenation yet remain undetectable. The emotional significance that the eyes possess is conveyed in the aphorism that “the eyes are the windows of the soul”. Eyelid surgery can correct drooping upper lids and puffy bags below your eyes - features that make you look older and more tired than you feel, and may even interfere with your vision. As a person ages, periorbital tissues age and patients often present with concerns about a “tired appearance”. Common changes that occur include brow descent, prominent wrinkles around the eye, redundant skin and fat bulging of the eyelids, “hooding” of the upper eyelid, loss of fat volume, and descent of lower lid tissues. Though these changes are commonly seen, distinct characteristics require a very individualized approach. Since these changes often accompany other age-related changes affecting the rest of the face, this surgery ideally requires expertise in the various aspects of facial rejuvenation. Blepharoplasty can be done alone, or in conjunction with other facial surgery procedures such as a facelift or browlift. After surgery, the upper eyelids no longer droop and the skin under the eyes is smooth and firm. Blepharoplasty can enhance your appearance and self-confidence. Blepharoplasty can enhance your appearance and self-confidence. The best candidates for blepharoplasty are patients seeking an improvement in the redundant skin and/or fat bulging or hollowing. Ideal candidates are seeking an improvement but not perfection and have realistic expectations, healthy, nonsmokers, off select medications (ask your Plastic Surgeon), and typically older than 35 years old. If redundant eyelid skin or “puffy” or “baggy” eyelids run in your family, you may consider a medical evaluation with your physician prior to undergoing surgery. A detailed medical, surgical and ophthalmologic evaluation is required. In the initial consultation, your surgeon will evaluate your health, examine and analyze the eyelids, brow, vision, and carefully assess your skin tone. Our doctors make sure your questions are answered and your goals are understood. Patient expectations are important to discuss at the consultation. Surgical technique is individualized to each patient. Be sure to mention smoking, medications, medical history, previous surgeries, and eyewear. Your surgeon will give you specific instructions on how to prepare for surgery, including guidelines on diet, medications, activity level, and smoking. Detailed instructions on activity before and after surgery will be discussed. If you smoke, plan to quit at least 4-6 weeks before the scheduled surgery otherwise an increased risk for infection and wound healing will occur. Avoid sun exposure before and after surgery as this may interfere with your scar. Patient preference will be incorporated into this decision. Blepharoplasty patients are performed as an outpatient surgery. The facilities we are privileged to operate from include Columbia Surgery Center (our private surgical suite) and William Beaumont Hospital of Troy where Dr. Schenden is chief of plastic surgery. General Anesthesia or I.V. sedation with local anesthesia (twilight anesthesia) may be individualized based on complexity of the procedure and patient preference. When the operation is combined with other facial rejuvenation procedures, special arrangements may be made to include short overnight stay. Blepharoplasty usually takes 1 to 3 hours, depending on the extent of the operation. Surgical technique includes removal of excess skin and incorporates a strip of muscle at the eyelid. The incision is concealed in the natural crease of the eyelids. Where necessary, excess fat may be trimmed to appropriate levels to enhance the “tired appearance”. The incisions are then closed meticulously with very fine sutures. Pain and discomfort will be adequately controlled with medications. Detailed instructions will be discussed at your consultation. Wound care will be demonstrated before and after surgery. Normally you may return to work after 2 weeks but with light duty and no heavy lifting or strenuous activity for 6 weeks. Swelling is expected with the majority of the swelling will improve within the first 4 weeks after surgery. Expect the final outcome of the blepharoplasty at 6 months after surgery. Scar will continue to mature (color change) up to 12 months. Healing is a gradual process, and your scars may remain slightly pink for six months or more after surgery. Eventually, though, they'll fade to a thin, nearly invisible white line. The positive results of your eyelid surgery and youthful look will last for years. Every surgical procedure involves a certain amount of risk and it is important that you understand these risks and the possible complications associated with them. In addition, every procedure has limitations. An individual’s choice to undergo a surgical procedure is based on the comparison of the risk to potential benefit. Although the majority of patients do not experience complications, you should discuss them with your plastic surgeon to make sure you understand all possible consequences of blepharoplasty.